Carpe the heck out of that diem. 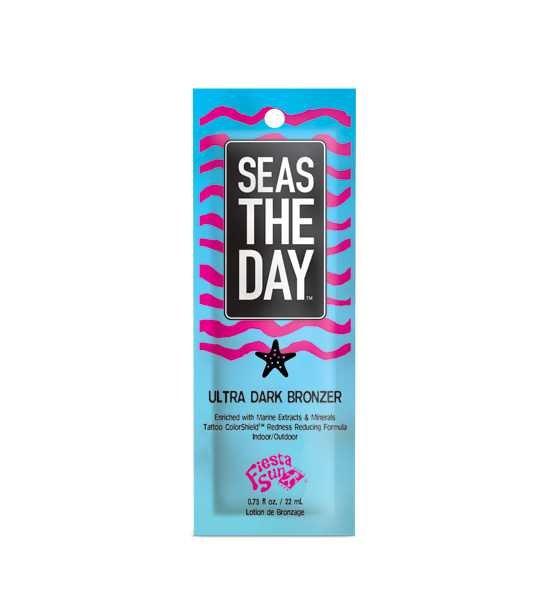 Seas the Day Ultra Dark Bronzer with DHA provides possibilities for golden dark color you didn’t even realize were possible. Enriched with Marine Minerals and Extracts that help provide nourishment for brighter, beautiful skin plus anti aging benefits for a younger looking appearance. Anti Reddening Peppermint Leaf Extract helps reduce redness for softer skin while allowing that bronze glow to shine through. Stop waiting for the perfect day or the perfect moment…make your life and your tan extraordinary. • Bronzing blend combines natural tan enhancers with DHA for deeper, darker, longer lasting color.